Transgenders in “Valhalla” (now a safe space), vegan vikings, female viking warriors, feminist viking society, muslim Vikings, and now the latest, black Vikings. 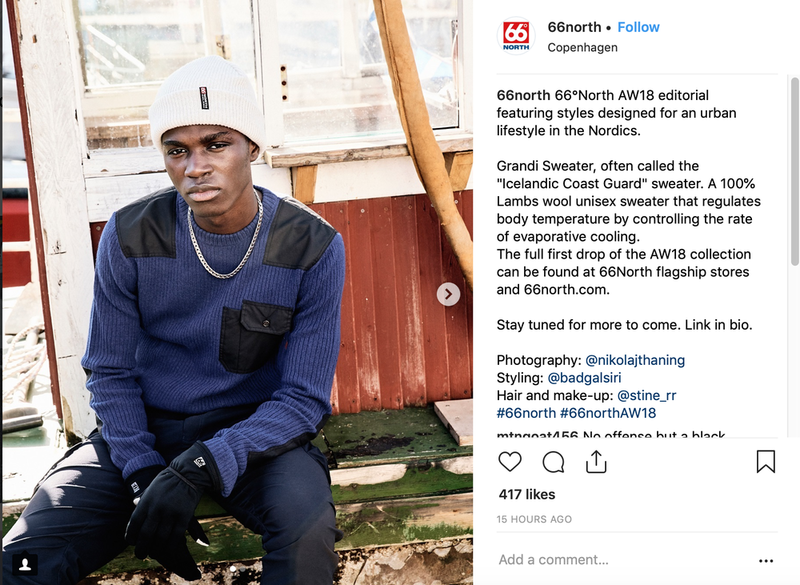 66 North, the Icelandic clothing brand (cheaply made in China), has gone full regressive liberal on everybody by featuring Icelanders for the clothing line as… black. We knew that Iceland had fallen lower than anybody could have imagined when the country used a transgender as the national female representation on the national day, started raising kids in school as gender neutral (as in emasculating boys from the earliest possible age), allowed migrants to use foreign names rather than comply with the Old Norse naming system in use for over a millennia, and started replacing traditional Viking culture tours in Reykjavík with…. feminist tours. But using a black dude as the new face of Iceland is still a new low. The new generation of Icelanders will have destroyed our culture within a decade after we had managed to keep it alive for over 1,200 years. The few of us left with a nut sack are so harassed and stigmatized, that we are typically pushed to exile back to Norway or Denmark, where we reconnect with our inner Viking by serving in those countries armed forces.